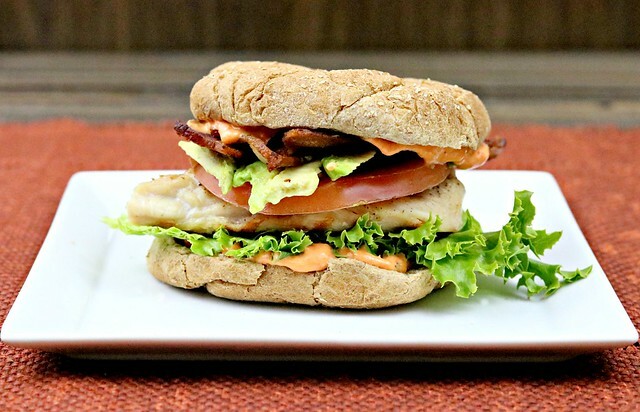 This grilled chicken sammich with creamy avocado, crisp bacon, and a creamy red pepper sauce will knock your socks off! Happy Wednesday, friends! I hope you all had a safe and fun 4th of July! I enjoyed a 4 day weekend from work, and J was able to be off with us yesterday, as well! It’s rare that we get a non-weekend family day together, so we are so grateful when we do! We had some friends over to grill some venison burgers and fajitas and had a really nice evening. We can see several fireworks shows from our back deck, so that eliminates the need to drive somewhere and deal with all the crowds. Plus, the baby goes to bed long before fireworks time. Years ago there was this sandwich shop close to where I lived, and a wrap that I was in love with, so I decided one day to try and recreate it at home in sandwich form. 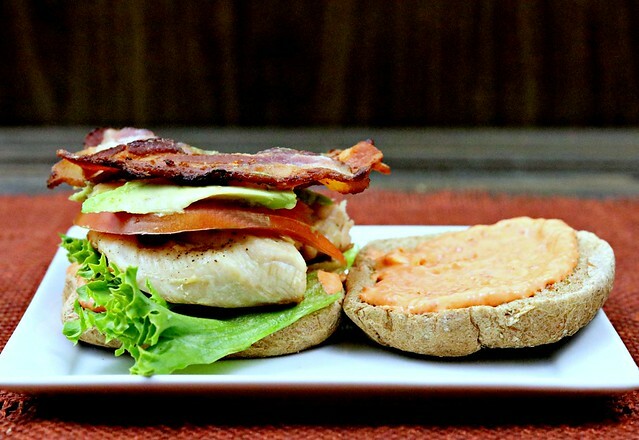 It’s basically a chicken BLT, but with an amazing creamy red pepper sauce. The sauce definitely takes it to a whole new level of yum. I first made and blogged this recipe back in 2011, and had never made it for J, so it was definitely time for a remake and better photos! We both enjoyed it, and he especially raved about the sauce. Something along the lines of it being the kind of sauce you could eat with pretty much anything! This sandwich is perfect for your summer grilling, or anytime you just want a great chicken sandwich!! Prepare the red pepper sauce by combining all of the ingredients together in a blender or food processor, then refrigerate while preparing the chicken. Cut the bacon slices in half, and cook until browned and crisp, then move to a paper towel lined plate to drain off any grease. Using a grill or grill pan, cook the chicken 3-5 minutes per side, depending on your cooking method and thickness of the chicken breasts. Meanwhile, slice the tomatoes and avocado (or prepare guacamole), and toast bread. To prepare the sandwiches, spread 1 tablespoon of the creamy red pepper sauce onto the bottom side of each roll, top a leaf of lettuce, chicken, tomato slices, avocado slices or guacamole, and 3 of the bacon slices. Spread a tablespoon of the sauce on the remaining rolls and place on top.